Unfortunately this was an oversight in our original aquarium design and there is no solution other than for us at Dream Aquarium to create a panoramic (extra-wide) aquarium suitable for display on multiple monitors, which unfortunately we don't have. There are some options if you don't like the zoom effect. -One option is to put different aquariums on each monitor, which you can do via "Aquarium Settings" -> "Multimonitor Settings". 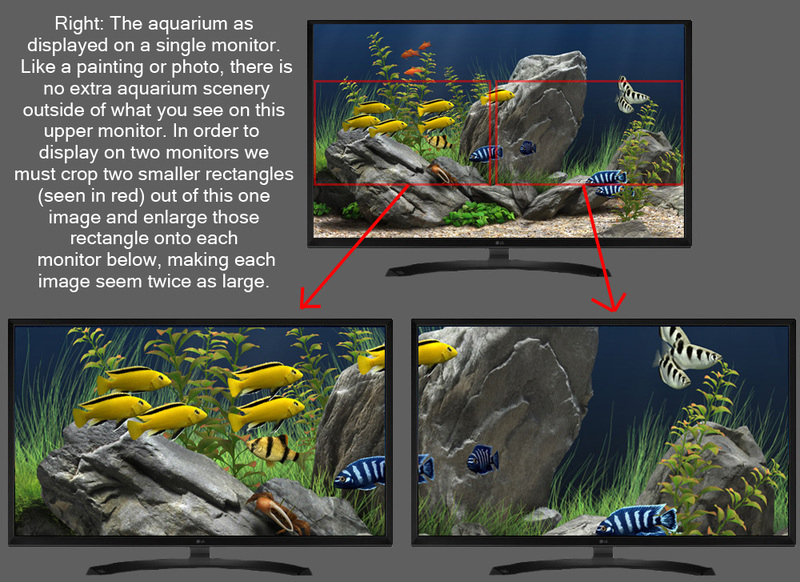 There you can select how aquariums are extended (or not) across multiple monitors. -The other option is to go to "Aquarium Settings" -> "Change Tank" and choose a "Custom Backdrop" tank (it looks like a solid blue tank in the selector). This option allows you to choose an image stored on your hard drive as a background. The aquarium will automatically adjust to the dimensions of the photo you include, so if the photo matches the aspect of your monitor setup, it will eliminate the zoom effect. The drawback is that they will lack the dimensionality and animation of the custom-built aquarium scenery.